MASKerade: RIC67 - Happy Birthday! This is my take on the current Runway Inspired challenge. The first two happened - I knew exactly what I wanted to do and after two attempts I could see that it just wasn't going to work. Actually the card was probably fine, but it didn't feel like 'me'. I started searching through my stamps and found this Penny Black butterfly that I just had to have when I saw Heather T play with it - of course I can't find the exact one on her blog now, but she's made quite a few amazing cards with it! All of a sudden I knew what I was going to do again. And this time I'm really happy with it. I think it captures the inspiration so well, although maybe not in an obvious way? What do you think? 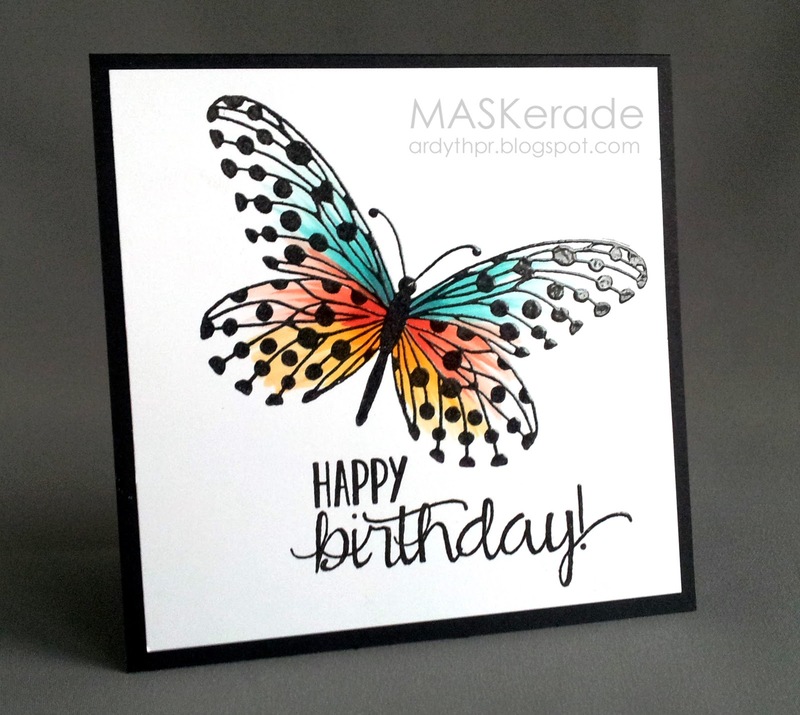 That butterfly stamp is really gorgeous indeed, and I love how you've used it on your card. I think it's a perfect take on the inspiration piece. your butterfly is soo beautiful, super card! Oh I love it. I think the polka dots on the butterfly pick of the pattern in the jacket and pants. The color is fabulous. I think it's a stunning interpretation of the RIC. The butterfly's embossed dots and the lovely colors beautifully evoke the spirt of the challenge picture. Gorgeous! And a perfect take on the inspiration picture! OMGoodness, what a perfect image and colors to interpret the inspiration photo. Your card is gorgeous! Brilliant - both of your cards! Aww come on Ardyth. Show us what didn't work. lol That butterfly is..... without words. So gorgeous. And then your added color makes it breathtaking. Honestly I think this butterfly card is my number one favorite of all your creations. It is CAS and has your pop of color and it is one to CASE. Yup, you totally captured the inspiration and kept true to your Ardythness. It's a total stunner! That beautiful stamp is penny black "social butterfly". Your card is breathtakingly amazing......soooooo you!! This is a fabulous interpretation of the inspiration pic, Ardyth. You are are so clever at thinking outside the box. I kept my design totally inside a box! Totally a "WOW" card!!! Low that it is embossed!!! Jaw dropping!!! This is gorgeous and fabulous. I guess it makes me feel just a teensy bit better knowing that sometimes your cards don't translate from your head to the paper (like mine often don't). Oh, do I love this Ardyth! What a stunning CAS card! Wow this is gorgeous and such a great take on the inspiration! ... this pretty stole my heart! That butterfly is gorgeous - love the colour on its wings! Thanks for strutting your stuff with us at Runway Inspired Challenge! The simple coloring is absolutely stunning! Thanks so much for joining us on the Runway! Just wonderful with the splashes of color on that fun black and white butterfly.